Last weekend, I headed on down to the MCM Comic Con in Birmingham. It’s primarily a comic book and memorabilia convention, but is chock full of everything science fiction and fantasy related. I had been toying with the idea of exhibiting my game at such a convention for some time, but this time finally got round to doing it. The convention is one of a number organised by the same company around the UK every year. I’d previously visited their London expo as a regular punter, since I’d always had an interest in comics and anime in particular, and it was within walking distance of my home at the time in London. However, when I got there, I found there was a whole section of the exhibition hall dedicated to gaming. Whilst my game was not directly related to comic books or anime, it was the same story for many of the other stands and products on sale (everything from ninja lego sets to custom cupcakes). So I eventually got round to booking a dealer table, hired a car and packed together everything I’d need to put on a show! There’s no point charging off to do something like this unless you know what you want to get out of it. Ultimately, it costs time and money, so there has to be a way to measure whether it was worth it. I booked the event about two months beforehand. I thought at the time that I would have a far more presentable and complete product. As it transpired, I had completed the tutorial, which subsequently served as the demo, rather than something I could fully show off or even take pre-orders off. I also had no OUYA consoles to sell, since it hasn’t shipped yet. 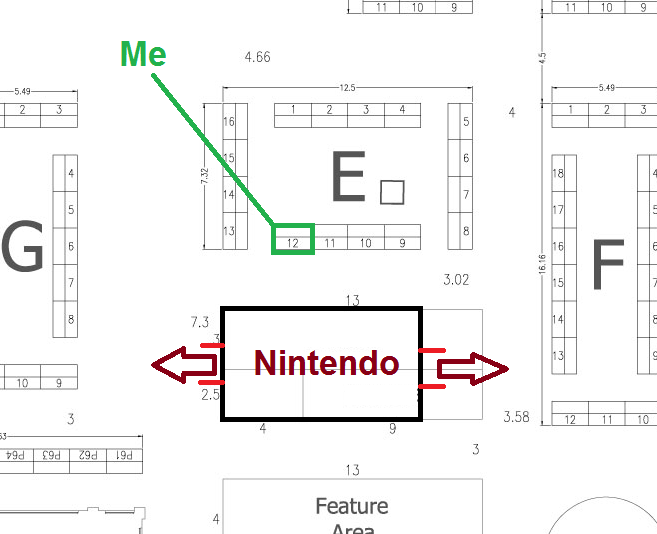 Turns out I guessed correctly that this would be the video games area, and my stand ended up directly opposite the shiny corporate Nintendo 3DS stand. In that regard it was perfect, as gamers attracted to the other games would be attracted to that part of the exhibition. It also meant there were no stands for people to look at immediately opposite. People who have just finished looking at a stand opposite yours often turn around after finishing with it to see what is next. It also gives people somewhere to go if you are currently busy / until the stand is free, and they can have a go themselves. Finally, not being the stand at the end of a T-junction made a big difference. People are already walking sideways / across the stand and have to actively look left or right, instead of straight ahead, to see the stand. Most exhibitors, stands and sellers had relatively cheap, pop up banners with glossy images of their products, which I didn’t have. That made the stand look a little less polished and professional, and meant people could not see what the product was from a distance (despite having the big TV screen showing the game). Contact details:I had the two side monitors showing the game’s main splash screen / box cover art, but only one of them had, in rather small writing, the company logo, website and twitter handles. On the first day, I forgot my business cards, and a lack of flyers meant people who wanted to know more had to take a blurry photo with their phone cameras of the screen corner. I forgot my digital camera (hence the lack of photos on this blog post). This was a major fail I realised, as otherwise I could use that as valuable marketing material for my game (showing people playing it, showing it in a colourful and active environment, and providing something to write about on this blog, on my development log, on other websites that might pick up on this story). When talking to people, standing behind the screen feels a bit removed from them, and also makes it very awkward to see what people are actually seeing on screen. There was a gap between mine and the next door stand for access, but it was too small and was being used by the neighbouring stand to likewise stand to the side of the customer and the product whilst making the sales pitch. I spent a lot of time actually standing in front of the stand, making it harder to make eye contact with incoming people, whilst also confusing people as to whether I was the stand owner or another customer, and that the stand was currently being used (so no chance for them to have a go). However, being woken up at 4am one night by other guests staggering in drunk, and having to wait 30 minutes for the shower to become free on the next morning (which meant I nearly didn’t get to the venue on time), was a big downside. Being near the other games was a big bonus, as evident by the conversations I had with most people who stopped by the stand. The line “want to have a go?” worked fantastically in drawing in people who had already glanced across at the stand or who’s eye I had caught. Being able to immediately offer something of value to the customer gives a platform to build a rapport with them that will eventually lead to a sale. Seeing people already having a go drew in yet more, who were interested in just seeing what was going on. Since I wasn’t able to sell the game, the objectives change slightly from sales, to promoting the game, getting feedback and determining if future events are worthwhile. For determining if this sort of event is a good way to promote a game, I think it definitely fulfilled that objective. It has helped in assessing the different demographics of people interested in the game, which will be useful for picking the events most worthwhile. It has helped confirm that it is possible to sell at events outside of the usual gaming oriented / dedicated conventions. Also the usefulness in terms of generating press interest and gaining industry contacts: I did meet a couple of people in the industry who took an interest and who might not have otherwise been present at traditional, gaming centric events. I also noted a distinct lack of press interest, so I can probably assume that unless it is a lack of banners and other stand presentation factors (and the fact I didn’t advertise the fact I would be at the event beforehand), it is probably safe to assume the event will not get me in any newspapers or website articles. Taking all the lessons learned to future events, I don’t believe in terms of raw sales, that it would ever actually do more than break even. Feedback I’d been hoping to get on the game was also thin on the ground (this is perhaps where meetups with others in the industry are more valuable). However, the additional factors, such as motivation (getting me out of the house) and raising the game/company profile tip things over into positive territory. 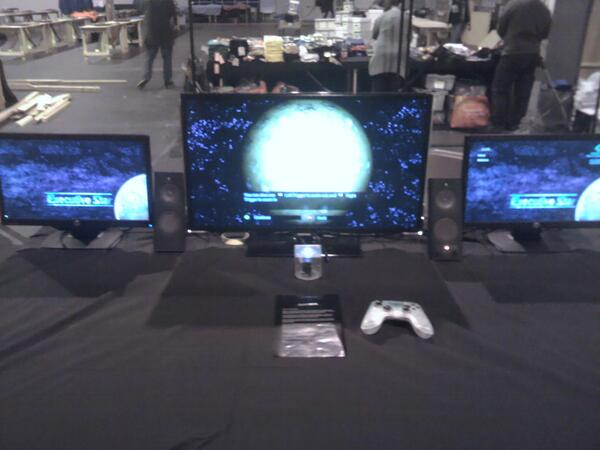 This entry was posted in Executive Star, OUYA by James Coote. Bookmark the permalink.